Yes, there is a bad pun in the title of my post today, but everyone love puns, right? (Cue the audible sighs and groans!) Anyhow, the pear in my title is referencing both the pear on my sweater, and also the idea of two things that are a perfect complement to one another. To be more specific, the perfect pairing, in my opinion, are these new windowpane pants from Target and my new suede Dulci pumps from J. Crew. I'm definitely in love with these two new purchases of mine and it just so happens that they pair perfectly together with the addition of an old favorite: this pear sweater from J. Crew. Actually, this pairing is an example of an outfit that wasn't really planned, but thrown together at 6:00am. Sometimes I think I do my best work in the wee hours of the morning when I don't have time to think things through too much! Bag: Louis Vuitton Epi Alma in "Menthe"
Love this Katie!! 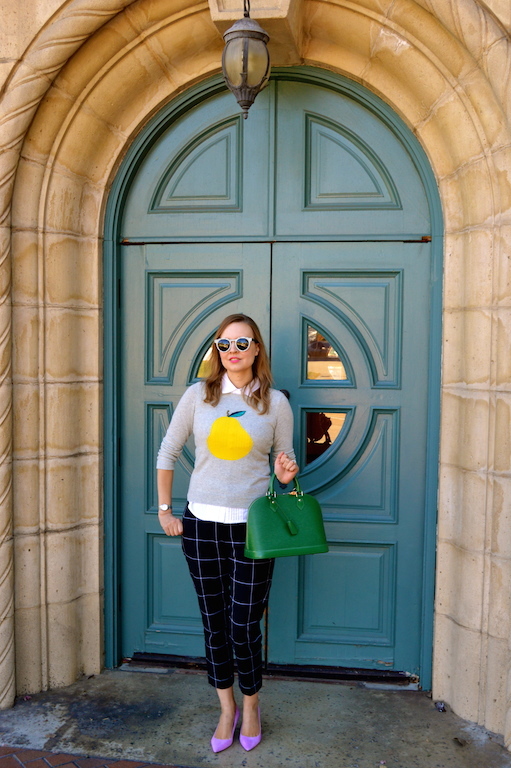 The colors, window pane pants, and that amazing green epi LV bag! U look great! I own almost identical grid pants and I have paired them with my light pink suede kitten pumps before. I showed that outfit about a month ago. I agree your pants and shoes are the perfect pear (hey I love a good pun). Dying over the sweater, pumps and sunglasses. What a fun, graphic top! Love the bag too! Adorable, I want this whole outfit yesterday. This outfit is such fun - love the print top with the check trousers. Your sunglasses make me smile - you look great. I love this pearing of the graphic sweater and window pane pants! 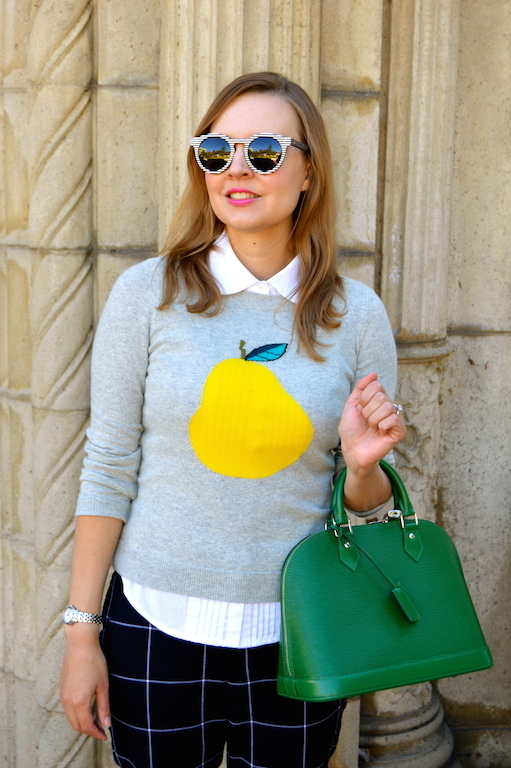 And who doesn't love a sweater with a fruit graphic on it!? I think I have been inspired to get out my pineapple sweater for today! Thanks for the inspiration. I mentioned on IG, love the yellow fruit and such fun with the print of the pants.You look great! Color ful! I love your pink heels and this cute little lemon top! Oh this is the loveliest. I am loving this "pearing" very cute!